Can You Green Your Halloween? Halloween is coming pretty soon, and I’m thinking on the costumes my kids will wear. I’ve long had the habit of making their costumes at home; it’s fun and it makes for more creative costumes. Last year was something of an exception, but not in a particularly bad way. My mother made a Dorothy from the Wizard of Oz costume for my daughter from fabric her mother had been storing for years and years, so all we had to buy was “ruby” slippers. 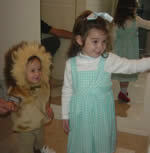 My son wore a lion costume we had been given as a hand-me-down about two years before. It just so happened to fit, and obviously was perfect as a companion to Dorothy. This year my daughter so far wants to be Rapunzel. That’s easy since she already has a costume for that. Little girls and dressup, what can I say? But dressing my son up is going to require some inspiration. He doesn’t understand about costumes yet, so won’t give an opinion. I’m just going to have to figure out what I want to do for him, I suppose. Keeping things green for Halloween can be a bit tricky, as it is for most holidays. But Halloween has been getting more and more commercial in recent years. It amazes me seeing the sheer range of decorations in my neighborhood. It used to be that having a couple faux tombstones on the lawn was plenty. Not anymore. I must confess that Halloween is a favorite holiday of mine. It’s just fun. No major family obligations. It’s about having a little fun for my family, and seeing how cute the kids can dress up around the neighborhood. And of course the candy. Not very green, but there it is. Making costumes at home just requires a little creativity. Look around at what you have and think about the costumes you would like to make. There are plenty of websites that have tips on making homemade halloween costumes. One of the fun things we did this year was to take some seeds from last year’s pumpkins, and grow our own pumpkins for this year. We got two good ones this year, oddly enough from the pumpkin plant that grew in a random part of the yard, nowhere near where we had planted the original seeds. The ones we did plant came up with a single good plant, and its pumpkin looks like bugs are getting it already. We doubt it will make it. But growing your own pumpkins from year to year is still a fun way to do it. You can also make your own decorations. For pretty much my entire childhood, one of my mother’s primary Halloween decorations for the inside of the house was a huge stack of bats she had cut out of construction paper. They’re very easy to make, and I really wish I had a template to post. But if you can draw a rough bat shape, that’s all you really need. You can also download some Halloween music and play it to set the right atmosphere, if you like. Finding organic Halloween candy can be quite a challenge, and you have to expect that if you have a child out trick or treating that they will bring back all kinds of candy. There’s nothing to do for it, and my own philosophy is to let the kids enjoy it. If organic candy is hard to find in your local area, you may be able to search Amazon and other websites to see what you can get. You may not have the selection that you would get just by heading out to your local stores, but it might be a bit better for the kids. Probably not much, since it is still candy. If you want to add to the fun, try playing little jokes on the trick or treaters. Nothing serious, but do things like offer rocks from your garden, onions and so forth instead of candy. This is something my mother is notorious for in her neighborhood, even though she really does give out candy. It’s just fun seeing the look on the kids’ faces at first. There’s a lot you can do to enjoy Halloween while keeping it relatively green and budget friendly. Perhaps the key tip is to simply keep it simple. 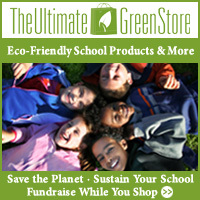 Published by Stephanie, in Budget Environmentalism, Eco Friendly Parenting, Going Green.